This Bodhi Leaf is out of print. 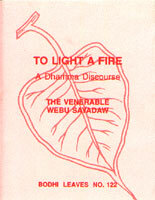 You can find it in the Collected Bodhi Leaves Volume V.
Do not get confused about the teachings. We don't have to know many techniques, only one; but that we should know clearly. If we establish one technique with strong effort and get rid of all doubts then, without asking anyone else, we shall find the answers. Choose one technique and practice it steadfastly. If you focus your mind at the small spot where the air touches when you breathe in and out, then there will be no wanting, no aversion or delusion, and as these three are absent, you are immediately out of suffering. So, for a short moment your mind is pure. Now, if your last mind-moment came up at this time and you died, would there be anything to be worried about or to be afraid of? The benefits accruing to you from this practice don't last for just a short moment or one life-time. This short moment of purity will bring benefits for the remainder of the cycle of birth and death. And why can you accomplish this? Because the time is right, your form of existence is right, and you are putting forth right effort.